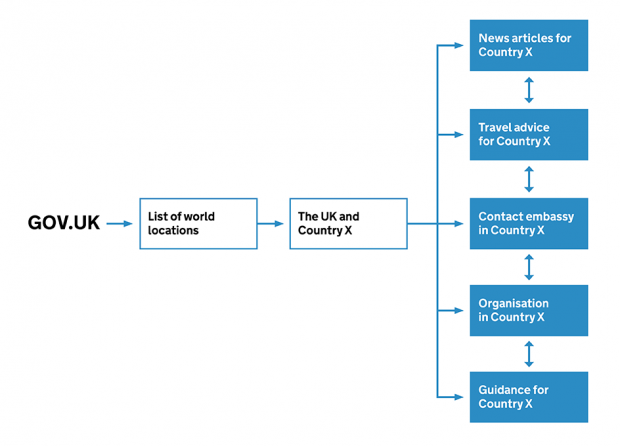 Our work started last year when we ran a discovery into international users on GOV.UK. One area of focus was worldwide publishing and formats on GOV.UK. We identified 2 significant issues. Firstly, world location pages were trying to meet too many conflicting user needs and failing to adequately satisfy any of them. Secondly, people weren’t finding services and guidance online while abroad. So they called embassies and consulates who then had to spend time redirecting them. There was no way for a user to navigate worldwide content in a coherent way. Content used to be grouped on a department-by-department basis. This meant users had to navigate government structures to find the services they needed in a particular country. In short, we’ve created new navigation pages to display the most commonly needed services and guidance. We’ve also repurposed the world location pages so they’re focussed on international events and diplomatic news. All the content is still there but it’s just found a new home. Instead of grouping content by service, we’ve grouped it by country. So, you’ll see that we’ve created a navigation page for each of the 200+ countries. These pages include information about generic government services, such as renewing your passport abroad, and also country-specific services, for example getting a certified copy of a document in India. Across over 200 embassy, consulate and high commission pages we’ve removed information that is duplicated in the navigation pages. For example, there’s a link to ‘check if you need a UK visa’ in the country navigation pages, so it’s been removed from the embassy, consulate and high commission pages. Users will still be able to access the content and publishers will still publish in the same way. These changes will enable GDS to develop new features and functionality in the future. 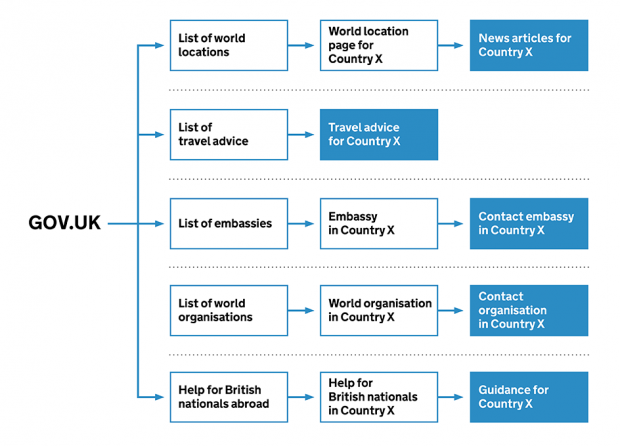 By stripping back duplicate information and only providing content about the services that embassies provide, we know we have improved the user journey. Users can navigate a clearer path to the information they need and complete their task without contacting the embassy. The intention is that embassy staff won’t have to handle as many calls. This will free up time to focus on core services, like helping British people in distress abroad. The changes mean that content will be easier to maintain. For a start, there is less content to update in fewer places. Additionally, there should be less duplicate content and where there is duplication, the taxonomy will make it easier to spot. Content will be shorter and more focused, so users are less likely to need to ring up for further assistance. We know that these changes are already improving the user experience, through A/B and remote usability testing. In usability testing, we gave our testers this task: "An Australian friend has applied for a visa to work in the UK but needs to speak to somebody about their application. What phone number should they call?" In the previous version of the content, people gave different answers that were all numbers for the diplomatic mission - be it a consulate, high commission or embassy. In the new version, people went to the UK Visas and Immigration (UKVI) contact pages and found the correct number. We’re confident that by rolling out the new version of the content globally, we’ll improve user journeys and free up Foreign and Commonwealth Office (FCO) resources. Don’t panic. All of the information and content is still there, it’s just the way that users get to it that has changed. Rob Rankin is a GOV.UK product manager and Lucy Hartley is a GOV.UK content product lead. You can follow Rob and Lucy on Twitter. It stands for Foreign and Commonwealth Office.